The acromioclavicular (AC) joint is the meeting point of the acromion and clavicle bones, often indicated with a visible bump in the area. AC joint injuries often occur as a result of a fall or other trauma, which may cause the acromion to move or separate from the clavicle, or cause the ligaments to be stretched or torn. While conservative treatment is often used first for AC joint injuries, surgery may be required for injuries that are more severe or those that cause prolonged pain. Surgery for AC joint injuries may involve removing the end or restoring the position of the clavicle to relieve pain and allow the patient to resume normal functioning of the joint. These procedures may be performed through arthroscopy or through a traditional open procedure, depending on the type and severity of each patient’s individual condition. Arthroscopy offers patients smaller incisions, shorter recovery times and less trauma. Your surgeon will decide which type of procedure is best for you after a thorough evaluation of your condition. 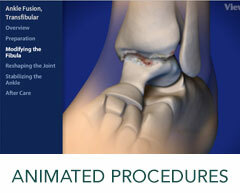 To learn more about our AC Joint Reconstruction Services, please contact us today to schedule an appointment!